Veterinary Radiologists can’t read the animal habits and behavior. Rather, they study what’s going on inside their bodies. They use non-invasive imaging technology, including radiographs (X-rays), CT scans, ultrasound, nuclear medicine imaging and MRIs to take photographs of animals’ internal organs to diagnose and treat various diseases. Like a traditional Radiologist, Veterinary Radiologists too capture and study pictures of bones, organs, blood vessels etc. of the animals. That help them to study various conditions of animal diseases such as arthritis, hypertension, osteoporosis, pancreatitis, diabetes, and cancer. In some cases, they may be required to check on unborn puppies and ensure safety and proper health of the mother and her pups. At times, they may also encounter a situation when an animal consumes something and faces digestion problems or swallows children’s toys or any unwanted stuffs. 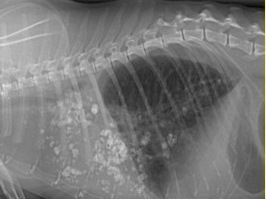 The Veterinary Radiologists take care of all these issues. Veterinary Radiologists usually work at privately owned clinics, radiological offices and non-profits. They also join research laboratories. They work with other veterinarians, technicians, nurses, pet owners, kennel staff etc. Education Requirements: The minimum educational requirement to become a Veterinary Radiologist, is a Doctor of Veterinary Medicine degree with specialized post-doctoral training in radiological imaging. The aspiring Veterinary Radiologists must obtain bachelor’s degree in science, which must include biology. That would give them an understanding of animals, their bodies and their problems. After completing the bachelor’s degree, the aspirants need to appear in the Medical College Admissions Test (MCAT) or Graduate Record Examination (GRE). The test scores will help them to get into the veterinary school of their choice. There are only 30 veterinary schools accredited by the American Veterinary Medical Association (AVMA). Veterinary school consists of four years of study, which includes coursework, laboratory training, clinical experience and hands-on experience. After passing out from the Veterinary school, the aspiring Veterinary Radiologists can complete a post-doctoral residency program under the supervision of a teaching Veterinary Radiologist. These programs help them required knowledge and training in animal radiology, MRI, Nuclear Medicine and Computerized Tomography. According to the DVM 360 Magazine, the average salary for a veterinary radiologist is $152,995. It is also one of the top 10 highest paid jobs in veterinary medicine. The Veterinary Radiologist earn in the range of $103,000 to $345,468, depending on their knowledge and experience.